The Magnum Energy MS2012 series inverter / battery charger is powerful, easy-to-use, and cost effective pure sine wave inverter. Pure sine wave: Power your T.V.s, stereos, plasma screens, and other sensitive electronics without worry. 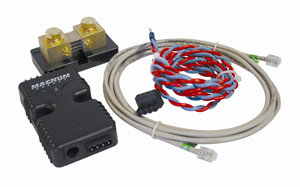 Power Factor Corrected (PFC) Charger: the Magnum MS2012 PFC charger is built into all of Magnum inverter chargers. Magnum MS2012 uses less energy from a generator than a standard charger using 25-30% less AC current than standard chargers. 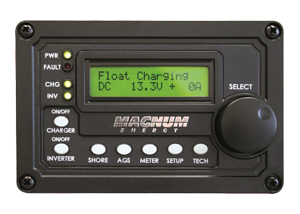 Designed specifically for the most demanding off-grid applications, the Magnum MS2012 inverter / battery charger is an affordable AC power source for Marine, RV or Emergency backup AC power. The Magnum MS2012 is powerful, easy-to-use, and best of all, cost effective. 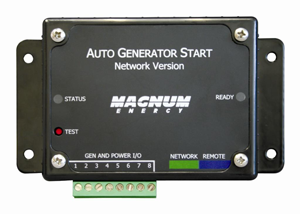 Install the Magnum MS2012 in four easy steps: simply connect the inverter's output to your distribution circuits or electrical panel, connect your shore power cable (AC) or RV cable to the inverter's easy-to-reach terminal block, connect the batteries, and switch on the power. 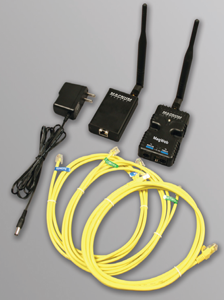 Safe and reliable: The MS2000, MS2012, MS2812, and MS4024 are ETL Listed to the stringent requirements of UL/cUL 458 for mobile use and the MS2012, MS2812, and MS4024 are ETL Listed UL 1741 and CSA C22.2 #107.1-01 for renewable energy installations. All models also meet KKK-A-1822E standards for emergency vehicle use. The Magnum MS2012 is ETL listed to the stringent requirements of UL/cUL 458 for mobile use and UL 1741 for off grid installations. Magnum MS2012 inverters are the brains of your new solar system. 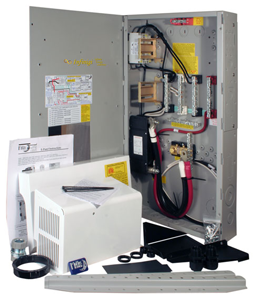 A Magnum MS2012 inverter will change the direct current (DC) power produced by the solar panels, or stored energy in batteries, and convert it into alternating current (AC) electricity that home, RV or Marine owners can use to power T.V.s, stereos, plasma screens, and other sensitive electronics without the distortion or electrical lines you sometimes get with modified sine wave inverters. When your Magnum MS2012 inverter is operating in inverter mode, DC electricity from your batteries is changed into pure sine wave AC power that works with most small electronics and mobile applications. When you batteries are charged 100%, the Magnum Energy MS2012 inverter switches over to standby mode. The Magnum MS2012 operates as a battery charger to convert incoming AC power into DC power to recharge your batteries while continuing to pass through incoming AC power directly to the inverters output ports. 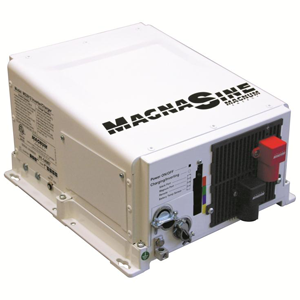 Magnum Energy MS2012 inverters can be used for a variety of purposes from emergency backup power centers to mobile applications such as an RV, truck or boat. 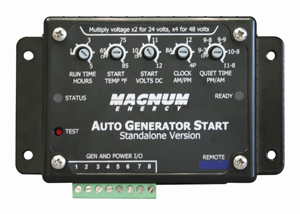 In these applications the Magnum MS2012 inverter provides power to the AC outlets using energy stored in the batteries of your RV, truck or marine vessel. The Magnum Energy MS2012 can power a wide range of household, RV or marine appliances. As with any appliance using batteries for power, there is a certain length of time called "run time" that your batteries will provide electricity. Actual run time is dependent of several variables including the size and type of appliance, the type of batteries installed as well as the age and battery's capacity. Other environmental factors can affect the amount of power your Magnum MS2012 can provide such as your battery's state of discharge (or charge) and the temperature where the batteries are stored. To evaluate your power requirements look at the name plate of the largest electronic appliance you want to run then look at the watt and surge rating of the Magnum MS2012. Your inverters consistent power capacity and surge capacity should be allow a 25% calculation factor when measured against the highest energy demand of your appliance. IMPORTANT SAFETY INSTRUCTIONS: Magnum MS2012. (OK, here is the scary legal disclaimer.) It is the responsibility of the purchaser to ensure that all products are installed and operated in accordance with local and national building codes as specific by the NEC (National Electric Code), UBC (Uniform Building Code) or IBC (International Building Code) and local utility company policy. 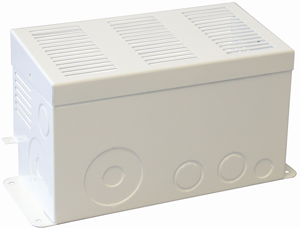 This product is designed for indoor or protected compartment installations. DO NOT expose the MS2012 to rain, snow, moisture or liquids of any type. Use insulated tools to reduce the chance of electrical shock or accidental short circuits. Remove all jewelry such as rings, watches, bracelets, etc when installing the Magnum MS2012 inverter or any other electronic gear. Always disconnect the batteries or energy source prior to installation or performing maintenance on the Magnum MS2012 inverter. Live power may be present at more than one point since an inverter utilizes both batteries and AC electricity. Turning off the Magnum MS2012 inverter may not reduce that risk. Always verify proper wiring prior to starting the inverter. Do not operate the Magnum MS2012 inverter if it has been damaged. Always read and follow the manufactures installation and operating instructions for the Magnum Energy MS2012 inverter prior to installation and operation.